Take any weekend during the summer, and you probably know someone who is either getting married, or is going to a wedding. The beauty of a warm summer day is undisputable. However, everyone knows that fall is the season when Mother Nature really shows off her gorgeous palette of incredible color. Not many things are more picturesque. A properly planned fall wedding can make your special day a magical experience that will be a source of fond memories for all those who attend. Before we discuss the many things that make fall weddings so special, let’s dispel a few common misconceptions: Though it is certainly the highlight of the season, fall foliage does not have to be incorporated into your wedding décor. Also, though the weather may be chillier, the wedding party doesn’t have to wear heavy layers of fabric for their dresses, nor do the men have to wear jackets. Dark colors aren’t required either. Bright, earthy tones can still be appropriate during this season. And lastly, by all means, if you don’t want to have pumpkins, you don’t have to. Besides, there are other colorful ways to reflect the season’s bounty. Apples, wines, pears and many other fall themed foods can serve quite nicely in place of pumpkins. Obviously, you’ll need to plan differently for a fall wedding, as opposed to a summer ceremony. Below, we’ll discuss some tips to make your fall nuptials as special and unique as possible. When renting, give us a call and discuss which style of tent best fits your needs, in relation to both the size and look of your ceremony, and following celebration. Depending on how late in the season your wedding date is, you may want a tent that will keep your guests comfortable in the cooler weather. Some couples prefer to rent their site for the day of and morning after to allow extra time for set up and break down. When setting your date, try to make it known as soon as possible. The fall may be a busy time for many of your guests. There are football games, a variety of school related activities and other fall distractions to contend with. Also, mention to your guests about the need to choose attire appropriately for the cooler fall weather. 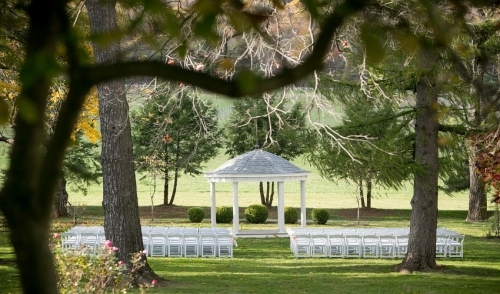 The fall foliage season can sometimes be a short one, so call and book your venue as early as possible. As expected during the fall, the temperature will be much cooler. Keep this in mind when planning your rental needs. For the ceremony, outdoor space heaters and heat lamps can make your guests comfortable. Once the sun goes down, a tent with appropriate heating is recommended. Since there is a risk of rain or mud, take that into account when determining the length of dresses for the bridal party. Shoes should also be chosen with this in mind. You have the opportunity to use the beautiful autumn foliage as the backdrop for your wedding. For some, that may be enough. However, feel free to dip into the season’s cornucopia of colors as much as you wish. The traditional fall hues of browns, yellows, reds, and oranges are fitting. For a more elegant and lavish look, consider rich fabrics, even velvet, in hues of chocolate brown, cream, eggplant, and metallic. Rich reds, such as wine and burgundy will also work nicely for this motif. Rustic accents such as acorns, silk leaves in fall colors, squash, hay, apples and cider jugs are all excellent ways to set the tone. Whatever level of formality you decide for your wedding will dictate the use of these accents. This is a great opportunity to take advantage of the seasonal ingredients when preparing your menu. Hearty fall vegetables, turkey, sweet potatoes, and cornbread are great examples. Spiced cider, cheeses and fall wines are popular as well. Desserts, such as apple and pumpkin pies, carrot cake and pumpkin spice cake are excellent ways of representing the season. Another nice touch would be to include traditional family recipes from both sides of the aisle. If the size of the guest list allows, have the food served family style as well. Because of the sometimes unpredictable fall weather, it may be a good idea to have an indoor back-up plan. Preferably at a location that still takes advantage of the season’s beauty. If renting a tent, utilize all of the decorating options available. Elegant curtains and tie-backs in rich fall colors can make a big impact. Ask for available lighting choices to set the mood you’re looking for. Select season appropriate flowers, such as mums, sun flowers, eucalyptus, garden roses, thistle and privet berry, for example. Centerpieces could incorporate fall fruits, such as apples, pears and cranberries. Have the Bride toss a pumpkin instead of a bouquet – ok, just kidding about that one. Basically, the fall palette is immense and you’re able to fill your canvas with as much of it as you like. For some, the simple elegance of being outdoors with a breathtaking autumn backdrop is enough to set the mood. But at the very least, who can honestly resist the food? Give us a call today and we’ll be happy to go over your options, whether you’re looking for tents, tables, chairs, linens, tableware or whatever else you need to make your special day as problem free and memorable as possible.